On April 30, Vietnam will celebrate Liberation Day, a holiday marking the 38th anniversary of the reunification of North and South Vietnam following a 19-year conflict. For Americans and their former South Vietnamese allies, that day in 1975 is remembered for the fall of Saigon, now Ho Chi Minh City, the end of the Vietnam War, and a communist victory. Before those memories fade, a special effort has been undertaken to capture for posterity the stories of those Vietnamese who took refuge in the United States following the war. “The generation that can recall what Vietnam was like, what the war was like, and also what the experience of immigration, and then resettlement was like, are starting to pass [die], and so we desperately need to capture their stories now,” said Thuy Vo Dang, director of the Vietnamese American Oral History Project at the University of California, Irvine. Located on a pleasant, leafy campus about 66 kilometers southeast of Los Angeles, California, the university is renowned for its Asian studies program. That’s appropriate for a campus located in Orange County, which is home the largest concentration of Vietnamese outside of Vietnam, more than 180,000, according to the 2010 Census. Two Orange County communities, Westminster and Garden Grove, are known as “Little Saigon,” and contain numerous Vietnamese restaurants, nail salons and other businesses. The Oral History Project was launched in 2011, and is funded by an anonymous donor. Researchers, including Vo Dang, interview participants about their memories of the Vietnam War and subsequent events. “I do many of the interviews, but I also train many of the students to do oral history interviews of Vietnamese Americans, who often are in their own families, or their neighbors or friends,” she said. 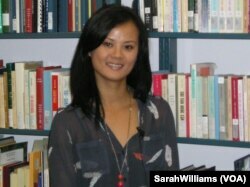 Thuy Vo Dang, Director of the Vietnamese American Oral History Project at the University of California, Irvine. Vo Dang was born in a small Vietnamese fishing village in the Mekong Delta, and arrived in the United States in 1984 as a child. Like some of her interviewees, she spent time in a refugee camp, but she doesn’t remember the experience because she was so young. The participants have diverse stories to tell. “Many people have opened up to me about their private personal losses, the loss of children, what it was like to lose their homes multiple times, from 1954 to 1975, and having to rebuild,” Vo Dang said. The final days of South Vietnam are recounted in the project’s archive. “A small number of my respondents left in 1975, and they could describe how the streets were filled with litter and guns, people had abandoned their ammunition on the side streets and the looting happened,” she said. Some of the narrations concern those who had no way to escape post-war persecution except on the open seas. Known as "boat people," the refugees had to face deadly storms, disease, starvation and pirates. The United Nations High commission for Refugees estimates between 200,000 and 400,000 died at sea. For those who made it to the United States, the new surroundings were often perplexing. “They were baffled by the grocery stores or how fast cars are going in the road,” she said. The stories of endurance are particularly significant, according to Vo Dang. She describes one woman who worked in a Los Angeles sweatshop for 30 years, and who agreed to be interviewed following her son’s urging. The university’s Southeast Asian Archive is a leading center for stories of people from Cambodia, Laos and Vietnam. Donated photographs and documents supplement the oral histories. Vo Dang has returned to Vietnam twice since settling in the U.S., once for research, and once for her honeymoon. “My husband and I left when we were really young and we wanted to share that experience of discovering our homeland together,” she said.